A series of papers by Martin and Ruiz (2001; 2002; 2004) describe the optical reflectance loss for PV modules and model the effect of these losses on annual energy. Martin and Ruiz (2001) establish that the angular losses (AL) of a PV modules are a function of the solar incident angle ( ). where T(x) is the weighted transmittance at incident angle x, R(x) is the weighted reflectance at incident angle x, and is the angular losses coefficient, an empirical dimensionless parameter to fit in each case. This angular factor is the incident angle modifier. 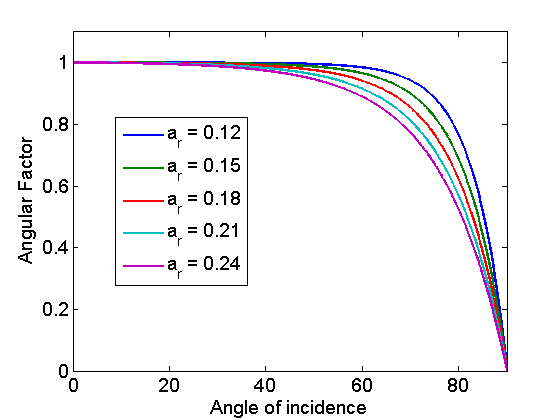 The angular factor can be experimentally determined for a finite number of incidence angles, α, and the data may be used to fit an appropriate angular losses coefficient, , to determine the angular factor for any incident angle. It should be noted that when experimentally determining , the light source must be collimated (beam irradiance). Martin, N., Ruiz, J. M. Calculation of the PV modules angular losses under field conditions by means of an analytical model. Solar Energy Materials & Solar Cells 70, pp. 25-38.